Every month I intend to create a bloggie wrap-up. I swear to myself I’m gonna do it next month. Then, the first of the month rolls around and I read Fyrefly’s and DevourerofBook’s, among others, and I say, “Ah CRAP! I forgot to do a wrap-up post! Dang it! Okay, I’ll do it next month, I swear…” And you’ll know how many times I’ve actually followed through on that when I say, “Yay! This is my first monthly wrap-up post!” LOL. K, I have ADD bad. I get distracted so very easily. Sometimes it’s TV or gardening or doing stuff with the kids, and sometimes it’s computer games like SecondLife or World of Warcraft or the latest, face book apps. SecondLife pulled me away from everything for about 5 months straight, and now I can’t remember the last time I was on. With WoW, I’d learned a thing or two from SL, and so I didn’t go so long or so deep, but still I was absent for a while, traipsing through Azeroth. Facebook games are so getting old, and I’m down to a few that have to be tended daily: Farmville, the café game and the pet games. I’m mostly still doing those because my mom is actually on facebook, SHOCK! and the kids play, too, so I play with them. Where was I even going with that? Oh, ADD… lol, I swear, that wasn’t on purpose! Okay, I’m lost now… that was funny, and I laughed, and lost my train of thought. Oh well, must not have been too important. That’s why I like to outline things, and why I hate stream of conscious storylines. I get lost enough in my own thinking, I don’t need to do so in a book! Maybe ADD is why I hate long paragraphs? It feels like being trapped in a room with no windows. I often skim through the middle of them, or just read the first and last lines of it and move on. Joined a total of 13 reading challenges, 11 of which are being tracked on my Reading is Challenging! page, as well as two more at LibraryThing: The 75 Book Challenge, and the Books off the Shelf Challenge. The Sookie Stackhouse Challenge was in progress, though I don’t know if I can call it progress, since I have YET to pick up the first book. Actually, I picked it up, read 2 paragraphs, then put it back down… don‘t tell BethFish :-D. This is the most challenges I’ve ever participated in, and I don’t expect to complete them all, realistically, but I’m hoping! Spent a total of 21 hours working on blog improvements as part of Bloggiesta. Thanks, Natasha! And after all the work everyone else did and the mini-challenges I wanted to do but didn’t get to, I now have a longer to-do list than when I started! 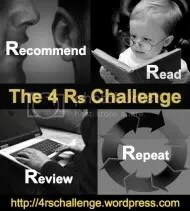 Created The Welsh Reading Challenge blog. After reading how other bloggers who host challenges have found a separate blog is a better way to keep it all organized, I started the blog for TWRC during Bloggiesta, and had it open and ready for visitors about a week later. We’ve also got a couple sponsors, some mini-challenges in the planning stages and some prizes on the way 🙂 Too cool! 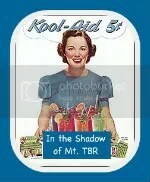 Started a weekly award called The Kool-Aid Flavor of the Week. I’m still trying to figure out the exact criteria for this, but right now it’s been for people who are doing something to make the world better. Presenting Lenore received my inaugral award for her International Book Blogger Mentor Program, and She’s Too Fond of Books received the second for her post about Kiva.org and how micro-lending requires so little of us and can make such a difference in the life of someone overseas. Joined the Tolkein Readalong. I’ve been wanting to read the Lord of the Rings for a long time, but just needed the push. Of Bees and Mists by Erick Setiawan ~ A magical and fantastic adult fable about love, self-respect and self-confidence, about doing what’s right and forgiveness. I gave it 4 stars. It counted toward my ARC Reading Challenge, New Author Challenge, and POC Reading Challenge. Fruits Basket, Volume 5 by Natsuki Takaya ~ I love the Furuba series, and volume 5 introduced Kisa, the tiger, and Hanajima’s little brother. I gave it 5 stars. It counted as a food title for my What’s In a Name?3 Challenge, Manga Challenge, and POC Reading Challenge. Any Given Doomsday by Lori Handeland ~ Atrocious, far-fetched and just plain BAD. 2 stars. It counted toward my ARC Reading Challenge and New Author Challenge. Charlie and the Chocolate Factory by Roald Dahl ~ Filled me with warm feelings of childhood and chocolate, and was a pleasure to read cuddled up with Maggie. I gave it 5 stars. It counted for The Welsh Reading Challenge. Islands Apart by Ken McAlpine ~ Interesting reflection on life in our modern world and how our advances in technology are contributing to a decline in interpersonal relationships, as well as a disconnect from nature. I gave it 4 stars. This counted for my ARC Reading Challenge, New Author Challenge, and We Didn’t Start the Fire Challenge. The Blue Notebook by James A. Levine ~ Reading this felt like a prolonged hug from creepy Uncle Stan at the family reunion, but was a necessary evil. Still, I stand by my 2.5 rating, which is based more on the writing itself than the book’s subject material. I wasn’t wowwed by Levine’s writing, though it had some beautiful moments. This book counted toward my ARC Reading Challenge, New Author Challenge, and POC Reading Challenge. The Hobbit by J.R.R. Tolkein ~ I finished off this month with a comfort read and old friend. Even though it was a third read through, not to mention the numberous times I watched the 1977 cartoon of it growing up, it still held my attention and kept me in suspense, a sure sign of a classic book. 5 stars for sure. This was for the Lord of the Rings Readalong and counts toward my 451 Challenge. Laza at Gimme More Books! Kimberly at A Child of the King! Kitty Litter Cake (and Cat Litter Cake), Gary Larson (and The Far Side) and qoutes for The Book Thief are the most widely used search terms that bring people by, along with Confessions of a Shopaholic and Vampire Kisses bringing in plenty, too. “erotomania” surprisingly, brings in a fair share. Uh oh, do I have a stalker? These posts must take forever right? That’s why I’ve never managed to do them…well not good ones anyway! Lenore – Yeah, it probably would have taken a long time if I’d have sat down yesterday to do it, a frightfully daunting task, to be sure. That’s why I had never done one before. However, I started this one right after Bloggiesta, and then just kept adding reviews, events and commenters as the month progressed, then it was only a few minutes after a review or post. Not nearly as daunting that way. I’ll start the February one after I post my first review for that month, and then just keep in up. The things that surprised me by doing this was how many people commented. I’m guessing a lot of that was due to Bloggiesta, one of the mini-challenges was to comment on other blogs. But, then again, I also commented on a lot of new blogs because of Bloggiesta, too, and so it’s all worked together, and blog views doubled what they used to be when I was being a good blogger, and have stayed there. The staying there says they may have came over during Bloggiesta, but they’ve stayed for content, I think. Yay, congrats! Working on it piecemeal is the best way to go, I think! I always do my wrap-up posts a few minutes at a time whenever I can throughout the month. it also seems to be a better way to keep track of what you do, reviews and stuff you post, as well as, for me anyway, to keep me on track and a bit more focused. You and Nicki are smart to do a little bit at a time. I haven’t started mine (although at least I’m not going to try to do commenters, that would *really* take forever at the end of the month). Great update, I do a yearly update and it’s so much work. I wonder how you do it every month. I liked the way you worked through it. OoooooOOO AH! congrats on getting this goal accomplished.